MADISON, Wis. — As casinos have spread outside the confines of Las Vegas in the last three decades, most have sought to lure in patrons by promising they can offer a Sin City experience while remaining closer to home. Throughout the powerhouse performance at the Veterans Memorial Coliseum in the Alliant Energy Center, John and his band scarcely took a breather during a three-hour, 29-song set that by most measures blew away the packed-in crowd. If this show was awash with classic-rock nostalgia — and it certainly was — John was going to give his fans exactly what they wanted and at an unrelenting pace. This was not a concert to promote any new album. 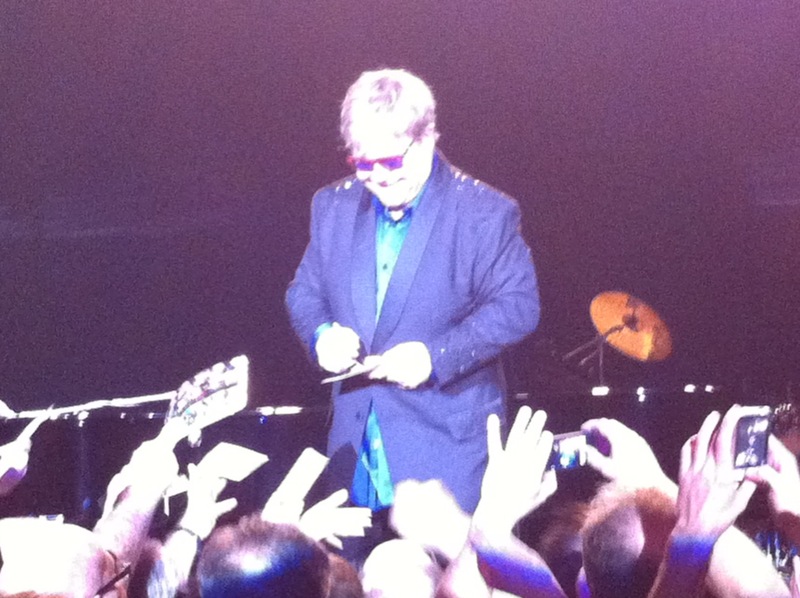 This was an Elton greatest hits playlist brought to the stage and perfectly done, just like a Vegas show should be. But, at the same time, this was a performance that underlined John’s persevering ability to connect with mainstream audiences and an unexpected egoless-ness that follows giving devoted fans exactly what they came to see. That John would prove to be such a consummate performer shouldn’t really be much of a surprise. While he co-wrote many rock-radio anthems and is an adaptable pianist, he was always more of a showman than artiste. (The outsized glasses and outlandish costumes were big giveaways.) More than that though, John was one of the leaders of a generation of performers who took rock music from nightclubs to the world’s largest arenas and stadiums in the ’70s and ’80s. There was no angst about selling out. That’s what he wanted to do! By the ’90s, John proved a pioneer once again when he took the music to where every form of entertainment has a second life: Vegas showrooms. Although John might still be able to fill any of America’s concrete barns, the Vegas style seems to have permanently framed his performances. Of course, there were the outfits. Outside of a casino, there are so few opportunities to wear the kind of long, sequins-beaded and monogrammed black coat that John wore. (Likewise, all his backing musicians wore tuxedos). There was also the bow taking that followed after every single song. But beyond the appearances, there was a marked professionalism and tightness to the musical arrangements that indicated this group knew the set list backwards and forwards. There was no danger or real radical reimagining of fan favorites. This was just hit after hit delivered with almost brutal efficiency. Few could find any reason to gripe. Why would any fan complain when John took the stage and delivered the one-two punch of “Saturday Night’s Alright for Fighting” and “Bennie and the Jets.” Such a high-energy opening put the audience on its heels and kept them on their feet, particularly when given a sample of John’s blustery vocals and lacing piano runs. Beneath blue-tinted glasses and occasionally gritting his teeth as he hunkered down in front of the grand piano, John added keyboard flourishes and trotting patterns to his hits as a chance to showboat a little before leading everyone into a little call and response. The higher end of John’s voice has faded into a throaty yelp these days, but he and his band played to their strengths that compensated from any diversions from the original recordings. John’s voice might have lost some range, but none of its character or power to inject Bernie Taupin’s lyrics with emotionality. During a funky, stirring performance of “Levon,” John’s baritone was impassioned and almost strutting as he guided the five-piece band, four backup singers and a two-man string section to the song’s crescendo. The song embodied the combination of influences of R&B, soul and Beatles pop that John and Taupin turned into formula in the early ’70s, and John had no problems recreating that feel or augmenting to it when he lead the group into a boogie-woogie piano workouts that showed his fast-finger pyrotechnics — much to the amazement of his band. Such was John’s instrumental prowess and the level of telepathy that existed between the performers that instead of using his voice or hand signals as cues, John led the band musically by playing brief passages that extended a song, reined it in or sent it spiraling in a new direction for a few bars. While John kept the songs mostly true, he did play familiar motifs to bring a new accent to a song or other times, just to wow fans that he already had in the palm of his hand. On “Tiny Dancer,” which John dedicated “to the ladies,” he brought all his capabilities to bear. He began the song in a solitary spotlight, likely recreating a familiar presentation from the “Almost Famous” days. Guitarist Davey Johnstone brought out a double-neck guitar and used a slide that subbed for the steel guitar licks from the LP version. The rest of the band remained poised to pounce, waiting for their boss to kick into the sing-along-ready refrain. John and company reeled fans in and as a result, lead a chorus of volunteers to howl in accompaniment. Even quieter moments offered little relief as John pulled on every heartstring by packaging songs like “Candle in the Wind,” “Goodbye Yellow Brick Road” and “Rocket Man” one after the other. And whether it was the musical grandstanding or the volley of hits, there was one point of John’s performance: to leave everyone breathless. This was especially true when it came to the swift pace his band maintained as it cherrypicked from John’s ’70s mega-sellers. Drummer Nigel Olsson could be seen taking pulls on an oxygen tank when the lights went down. John did allow himself a few moments of personal privilege. The melancholic “I Guess That’s Why They Call It The Blues” graduated from a slow, sad ballad to a peppier, workman-like tempo. A rearrangement like this might have failed for an “American Idol” contestant, but in the hands of John and his singers, became more sweetly mournful than emotionally draining. This was also the first song that he performed that wasn’t from the ’70s, and signaled a brief interlude when John presented two tracks from “The Union,” his 2010 collaborative album with fellow pianoman Leon Russell. He told the cheering crowd that the record’s critical and commercial success helped “get me back in the public domain, which is something I really wanted to do.” The new songs blended nicely with the generous mood. “Hey Ahab” was more deeply rhythmic than the classics and featured Johnstone’s excellent ZZ Top riffing. “Gone To Shiloh” might have aspirations of becoming a historic epic about the American Civil War although John and band were content to work it into an elegant, marching setpiece. Bringing festivities back to the present, he powered through latter-day power ballads like “Don’t Let the Sun Go Down on Me” and “Believe” with vocal gusto and generous string accompaniment before climbing still higher with bombastic takes of “Someone Saved My Life Tonight” and “Sad Songs (Say So Much).” To further punctuate the evening’s core purpose, John finished strong with hits like “I’m Still Standing, “The B**** is Back” and “Crocodile Rock” to prove to any diehards who’d thought he had played all of his hits already. After acknowledging the last in a long line of standing ovations, he walked off stage and returned to gratefully handle a horde of autograph seekers who surged the stage area. As he signed whatever was in front of him, he quietly nodded to thank fans who sang “Happy Birthday” to him three days ahead of time. He returned to the piano to close with “Your Song,” a song that he noted was written 42 years ago and that without which, he wouldn’t be on that stage. Perhaps that is the source of his willingness to people please. Regardless of his motives, it was the fans who turned out big winners — as it should be in Vegas. And in an odd twist, John’s performance also renders false another too familiar advertising ploy many casinos use: What happens in Vegas, stays in Vegas. In this instance, it’s a great thing that’s not always true. Thursday, March 29, Grand Forks , N.D.
Friday, April 21, Fort Wayne , Ind. Note: David’s nationally syndicated music column, Soundbytes, appeared in the Entertainment section of all Internet Broadcasting websites. This column was originally published there. ©Copyright 2012 by David Hyland. All rights reserved. This material may not be published, broadcast, rewritten or redistributed. 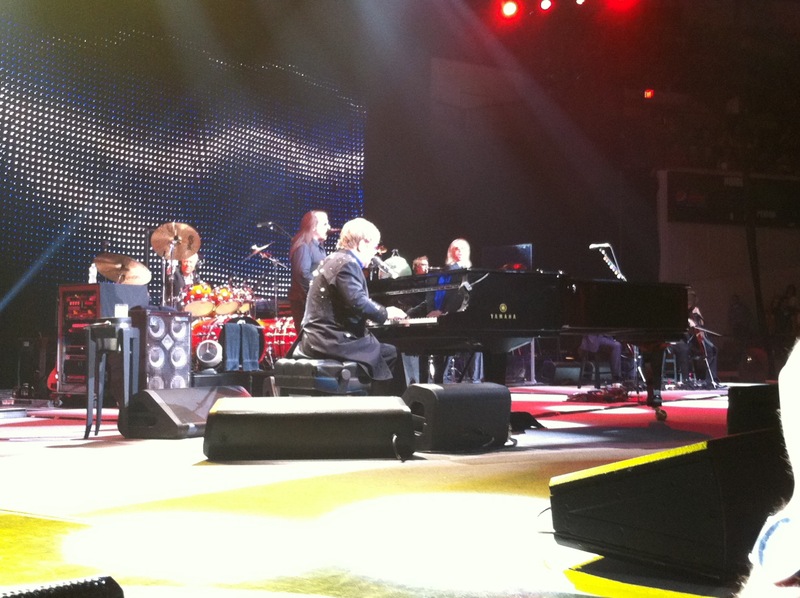 Tags: Alliant Energy Center, concert, Elton John, Madison, review, Wisconsin. Bookmark the permalink.